Updated: the longer article is now available, here. An article on tax competition in The Guardian, co-authored by Ellie Mae O'Hagan and Nicholas Shaxson. It's subtitled "Tax 'competition' – in which countries fight to lower taxes – not only hits the poor, it doesn't even help the economy grow." Which is exactly right. "A myth we're repeatedly told is that a country must be "tax competitive" in order to support a successful economy. It sounds so reasonable. We're taught that competition between companies keeps them on their toes and pressures them to produce better products and services, at better prices. But here's the problem: competition between companies in a market bears no economic resemblance whatsoever to "competition" between countries on tax. They are utterly different economic beasts." Now read on. This is one of the most important myths out there on international tax. 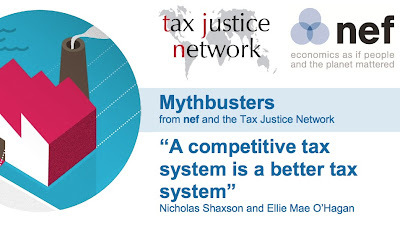 "Let’s tackle the economic illiteracy behind those calls for a ‘competitive’ tax system. If you write about it, always put ‘competitive’ in quote marks, to signal that you understand. And when a politician wheels out the ‘C’ word - get them to explain exactly what they mean. Or run for the hills." And there's plenty more about this in Treasure Islands, of course. A longer paper soon to come. The longer article supporting these conclusions is here or here. Another article by Martin Wolf, who's cited in the piece, is worth reading, here. "There are meaningful ways to talk about ‘competitiveness’ among countries. The World Economic Forum produces an annual “Competitiveness Index” for 144 countries built on 12 “pillars” of competitiveness: insitutions, infrastructure, the macroeconomic environment, health and primary education; higher education and training; labour market efficiency; financial market development; technological readiness; market size; business sophistication; and innovation. We think some of their choices are bad ones, but its goal to measure “the set of institutions, policies, and factors that determine the level of productivity of a country” seems reasonable. Most of the 12 ‘pillars’ depend heavily on public investment – which means tax. So it’s not obvious, even in theory, that tax cuts will make countries more competitive, as many people believe. After all, taxes raised don’t go up in smoke: they are not a ‘cost’ in any meaningful sense of the word, but a transfer, from one (private) sector to another (public) sector: shingles taken from one side of the roof to put on the other. In the WEF’s “competitiveness index” for 2012-13, two of the top four most ‘competitive’ countries in the world are Finland and Sweden, two of the world’s highest-taxed countries. Although some lower-tax countries such as Singapore also rank highly, there is no evidence that lower taxes make countries more competitive." We are not going to draw any particular conclusions from that: that's a very shaky, shallow trendline. One could think of all sorts of graphs here, most of them problematic. For example, a worldwide graph showing GDP per capita growth versus tax revenues as a share of GDP would quite possibly show higher growth in the low-tax countries. But this wouldn't tell us anything about causation: what it would most likely show is that if you are a low-tax country, you're more likely to be a poor country. And if you're a poor country, you're more likely to be enjoying catch-up growth with the mature, rich economies.